Giving Is Gorges Starts Tonight! For the next 24 hours, you have a great opportunity to support the Ithaca Shakespeare Company through Ithaca's unified nonprofit day of giving, Giving is Gorges. Giving is Gorges is a chance for Ithaca to come together over a single 24-hour period and collectively show our support for the causes we believe in. This year's day of giving runs from 6 pm tonight, May 9, through 6 pm Wednesday, May 10. Your support will be invaluable for helping ISC mount its two summer 2017 productions, Richard III and Much Ado About Nothing. Producing these large-scale outdoor performances each year involves the work of 40 or more performers, designers, and technical personnel, along with the support of many volunteers. It also requires a substantial amount of money, only about 50% of which can be covered by ticket sales. For the rest, we need your help. As Shakespeare himself said: "If money go before, all ways do lie open." By making a contribution now, not only will you be supporting these two great performances, you will provide us with the financial resources to launch some exciting new performance and outreach programs in the near future. ISC is excited to continue its 15-year tradition of making quality Shakespeare performances accessible to all — but we can't do it alone. So please take a moment to join others from our community on this unified day of giving and make a contribution. The casts are set, plans are afoot, and the first rehearsals begin in just a few weeks...our fifteenth summer of Shakespeare is almost here! This year, we'll be pairing the final installment in our history play sequence with one of Shakespeare's most popular battle-of-the-sexes romantic comedies! 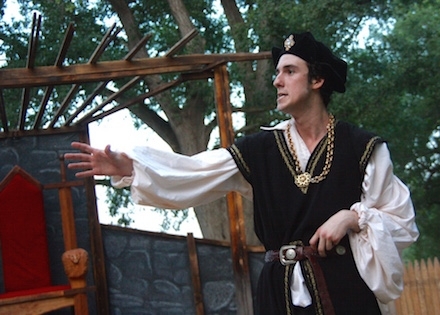 The grand finale in ISC's epic series of Shakespeare's English history plays! The Wars of the Roses are over, the house of York has been victorious, and England is at peace...until Richard of Gloucester begins maneuvering against his own family to take the throne for himself. Shakespeare's most fascinating villain sends the country spiraling back into civil war, leading to a final confrontation in which the living and dead alike must battle for the soul of the nation. When Don Pedro and his soldiers arrive in sunny Messina for some much-needed R & R, love blossoms, and Beatrice and Benedick rekindle their merry war of wit. Don Pedro attempts to out-do Cupid by tricking Beatrice and Benedick into falling in love with each other, while Don John and his drunken henchmen scheme to ruin the marriage of their hated rival. Music, dance, romance, one of Shakespeare's wittiest heroines, and the most hopelessly hilarious night watchmen ever imagined come together in this brilliant romantic comedy.